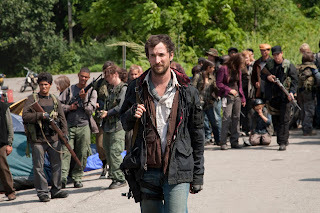 Q: Noah Wyle’s new show, “Falling Skies,” is wonderful. Do you know if it has been renewed for a second season? — Theresa D., Harrisburg, Pa.
A: You can bet your sweet bippy that TNT has renewed cable’s No. 1 new series for another season. The alien-invasion saga, which airs Sundays at 10 p.m. (ET/PT), also stars Moon Bloodgood, Will Patton and Drew Roy, and is executive-produced by Steven Spielberg. TNT has ordered 10 episodes for the second season, which will air summer 2012. “‘Knots Landing’ was a down-home, simpler, more-pained version. Very real people going through very real situations. But so far, no, I haven’t heard of any plans for doing that.” For now, you can catch Nicollette in the Hallmark Channel original movie, “Honeymoon for One,” which premieres Saturday, Aug. 13. Q: I’ve seen commercials for a new police drama on Lifetime, but I didn’t catch the name of the show. Could tell me about it? — Derek F., Fort Lauderdale, Fla.
A: You’re thinking of “Against the Wall,” which is part police procedural, part family drama. It centers on a family of Chicago police officers, and stars Rachael Carpani, Brandon Quinn, Treat Williams and Kathy Baker. The show airs Sundays at 10 p.m. (ET/PT). A: What you heard is only half-true. Ted is indeed going to star in another show; however, he won’t leave “Bored to Death.” He will remain a series regular on the HBO comedy that also stars Zach Galifianakis and Jason Schwartzman, and is slated to return for its third season this fall. Ted also has joined the cast of “CSI: Crime Scene Investigation,” where he’ll play the new supervisor for the Las Vegas CSI team. “CSI” returns for its 12th season Sept. 21.